Have you dreamed of owning a Mont Blanc pen but can’t afford the price tag? Now you can afford a designer pen with the look and feel of Mont Blanc but at a price you can afford. Lanier’s Cross Style Designer Pen has the beautiful sleek design and the balanced weight of a Mont Blanc. If you bought a Mont Blanc you could afford one, but now you can buy a different color Designer Pen to match your outfits, or to use a different one each day of the week. Now that you know you can afford a Designer Pen, it gets even better because you can customize it so it’s your ‘personal pen’. You can build your pen out of more than sixty exotic woods from around the world, and different plating options such as 24kt Gold for the trim. 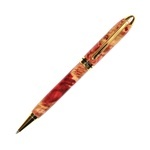 You get to design your designer pen, so it has your personal touch. First you can select from one of more than sixty exotic woods from different continents. Ever dreamed of owning a piece of African art? Your designer pen can be made from some of the most exquisite woods from the Dark Continent. Or select a beautiful one-of-a-kind wood from Australian, Asia, the United States’ frontier forests or other locations around the world. 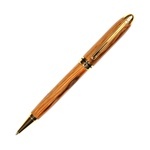 After you pick out your wood, select the plating options—including Titanium Nitride, Rhodium or 24kt Gold—for your pen’s trim on the cap, clip and tip. That will enhance the beauty of your hand polished wood, and make your pen even more durable for years to come. Your custom made Cross Style Designer Pen uses the Schmidt C600 Cross Style ink refill , and you can pick from black or blue ink. 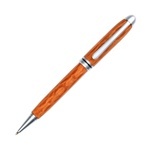 This pen features the easy-to-use, twist mechanism making it one of the popular styles of pens you’ll want to use every day. The Cross Style Designer Pen is sought after as promotional pen for corporate gifts, awards and even for that special gift that someone will cherish the rest of their life. You can also personalize your Cross Style Designer Pen for yourself or as a gift, by having your pen engraved, in addition to a Rosewood gift box. You can also order a matching Cross Style Designer Pencil to make your gift or collectible even more special.